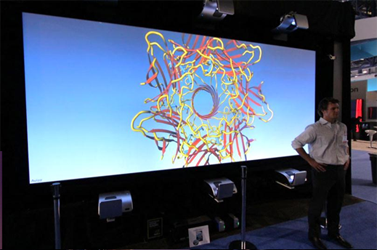 Many display applications benefit from combining multiple projectors or displays into one larger display surface. If all the displays are aligned in a grid with no overlap, features like Mosaic make it easy to create a single unified display from multiple physical displays. When the displays are rotated at odd angles or the display surface is an irregular shape, multiple projectors need to overlap, blend together and be mapped or adjusted to the display surface. The Warp and Blend SDK provides an easy way to bring this functionality to any application with minimal performance impact and no incremental latency. In the example above both warp and blend are used to achieve a seamless, blended picture from two projectors illuminating a curved screen. A standard practice when using multiple projectors is to overlap the seams where each projected image touches another. Since optics and screens are never perfect and overlapping can create hotspots (regions gets twice amount of light) blend is used to adjust the intensity of the overlapping region. Warp is used to modify geometry so that it matches the curve of the projection wall. 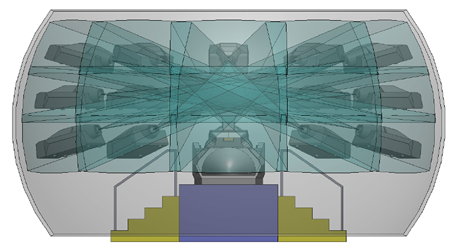 Traditionally, warp and blend operations are done with custom hardware using features built into the projector or with direct modifications to an application. 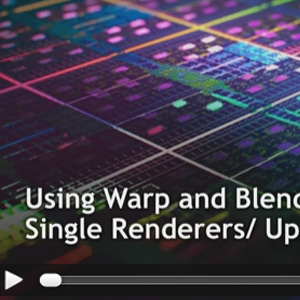 The Warp and Blend SDK provides an easy way to bring this functionality to any application with minimal performance impact and no incremental latency. 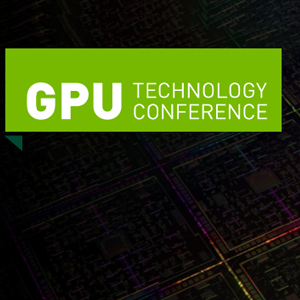 NVAPI is NVIDIA's core software development kit that allows direct access to NVIDIA GPUs on windows platforms. Warp and blend is implemented as an interface in NVAPI that programmably exposes warping and intensity adjustment features before the final scanout. Working in conjunction with a supported NVIDIA Display Driver, the warp and blend features works on a single screen, multiple screens and multi-gpu configurations and are available only with NVIDIA Quadro GPUs. Download the Warp and Blend programming sample package to get started developing with warp and blend and NVAPI. To download, you must be a member of NVIDIA Developer - DesignWorks. By clicking the "Agree & Download" button below, you are confirming that you have read and agree to be bound by the SOFTWARE DEVELOPER KITS, SAMPLES AND TOOLS LICENSE AGREEMENT for use of the SDK package. The download will begin immediately after clicking on the "Agree & Download" button below. 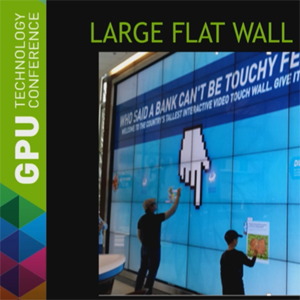 Generate a seamless image on up to 16 displays or projectors with warp and blend using NVIDIA Mosaic Technologies and NVIDIA Quadro Sync (ability to synchronize up to four Quadro GPUs per system). Apply warping to any scenario that requires image geometry corrections such as rotation, skew, mirroring, offset, and geometry mapping. Adjust intensity and black level in portions of a screen, every pixel if desired. Minimal performance impact and no incremental latency. 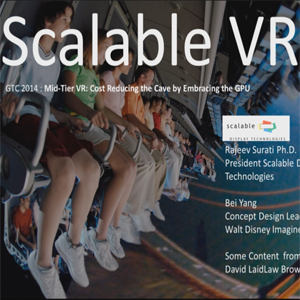 Works in single screen, multiple screens and multi-gpu configurations. Why do Warp and Blend on the GPU? The Operational Based vision Assessment (OBVA) Simulator at NASA. 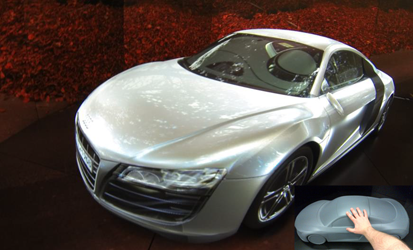 A 1:5 scale, blank canvas model car with car’s features projected onto the surface of the model to replicate a photo-real, physical object for real-time interaction and customization. Image courtesy of Joachim Tesch. Max Planck Institute for Biological Cybernetics. Using a matrix of projections projected to a single screen to present a seamless large scale, single image.